I have realized we do not eat enough beef. Part of it is because I am very particular about where I purchased my beef from and I hate making multiple trips to different stores when I grocery shop. But, I will, if need be. Last night was a Nutrisystem cheat night. And man was it worth it. The Texas Beef Council shared this yummy recipe with me. I love a gourmet salad and boy did this one deliver. Tenderloin, and pear and cranberries and feta cheese. Did you know they have feta cheese in heaven? They do. 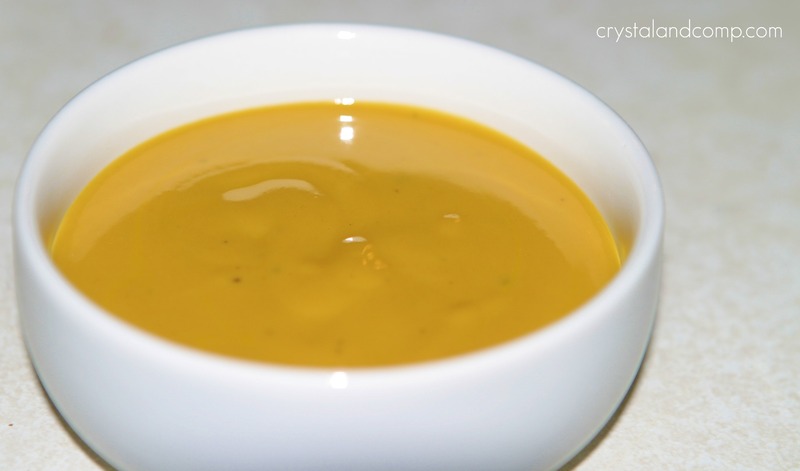 And if you are a fan of honey mustard dressing, you can make it easily at home. Super easy. Ready for a 30 minute meal? Pop the steaks on a low-medium grill, cooking on both sides until you get the degree of done-ness that makes birds sing. I understand this is different for everyone. Here are some tips for grilling beef. 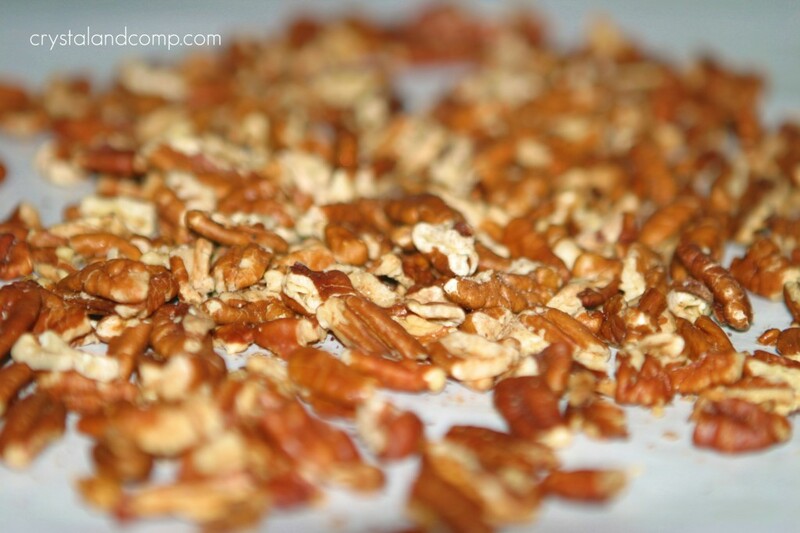 While that is going, toss your pecans on a cookie sheet and bake them in a 350 degree oven for about 3-5 minutes to toast them. 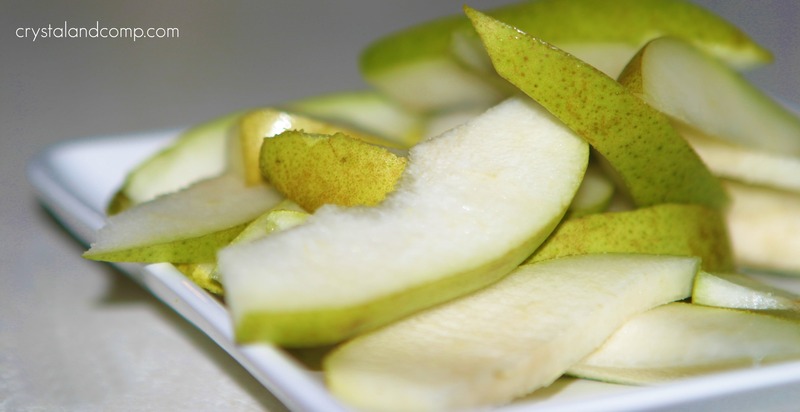 Core and slice your pear. Once the steak is done on the grill, bring it in and let it rest about 10 minutes. Once it has rested, slice it up into thin strips. Now you will assemble the salads on each plate. It is easy peasy. You’re going to divvy up the salad ingredients into fours. Place a fourth of the bag of baby greens on each plate. 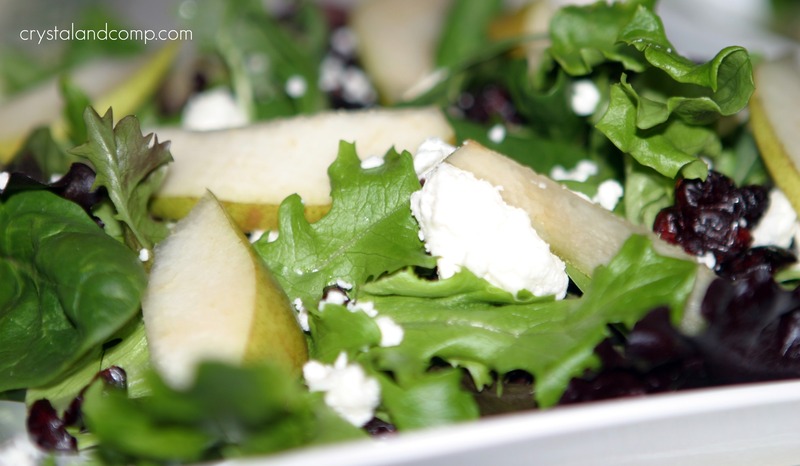 Top each salad with a fourth of the pear wedges, a fourth of the cranberries and a fourth of the crumbled feta. Top each salad with sliced tenderloin steak. Then top each salad with pecans. The dressing comes together super quickly. Mix each of the dressing ingredients in a bowl and whisk it all together. I added a little extra salt (Kosher), just a pinch, and a little extra white wine vinegar. Drizzle it over your salad and dinner is served. Being that this is a fancy salad, I changed things up a bit for my little kids. I served them sliced steak, mac and cheese, a small side salad, and sliced pears. This involved little work for me. Well, there was some convincing with the pears. No really, they are a lot like apples. Only different. Just try them. What do you know. They liked them. The are passionate about educating consumers about their beef and the journey from farm to fork. Once the steak is done on the grill, bring it in and let it rest about 10 minutes. Once it has rested, slice it up into thin strips. Now you will assemble the salads on each plate. It is easy peasy. You're going to divvy up the salad ingredients into fours. Place a fourth of the bag of baby greens on each plate. Top each salad with sliced tenderloin steak. Then top each salad with pecans. Next, prepare the salad dressing. Mix each of the dressing ingredients in a bowl and whisk it all together. I added a little extra salt (Kosher), just a pinch, and a little extra white wine vinegar. Drizzle the dressing over the salad and dinner is served. I got the garlic idea from Mommy Upgrade. Such a great idea! I am so excited that I now have an easy honey mustard recipe at my fingertips. So delish! This is a wonderful recipe. We actually eat a lot of pears (my husband is Italian and maybe that has something to do with it??). But we love them. I never thought of putting them on a salad though! 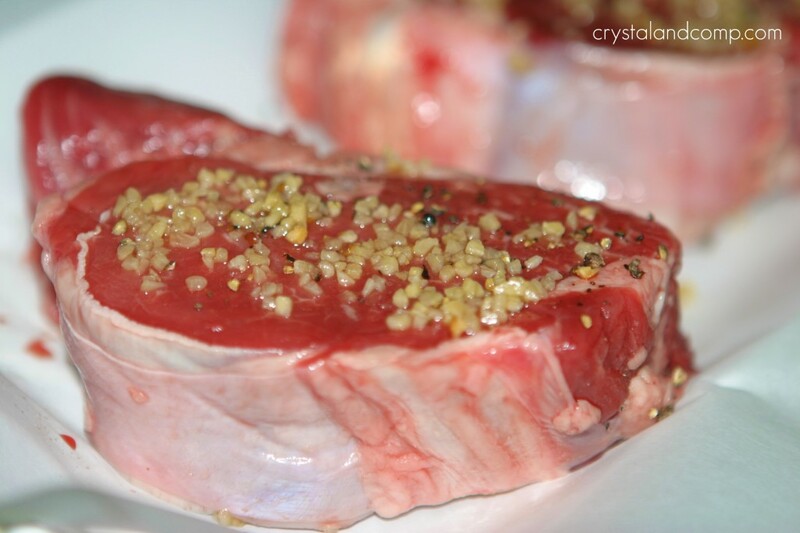 And, absolutely love the touch of garlic on the steaks. I always rub my salad bowl with a clove no matter what we are putting in it! It’s great. 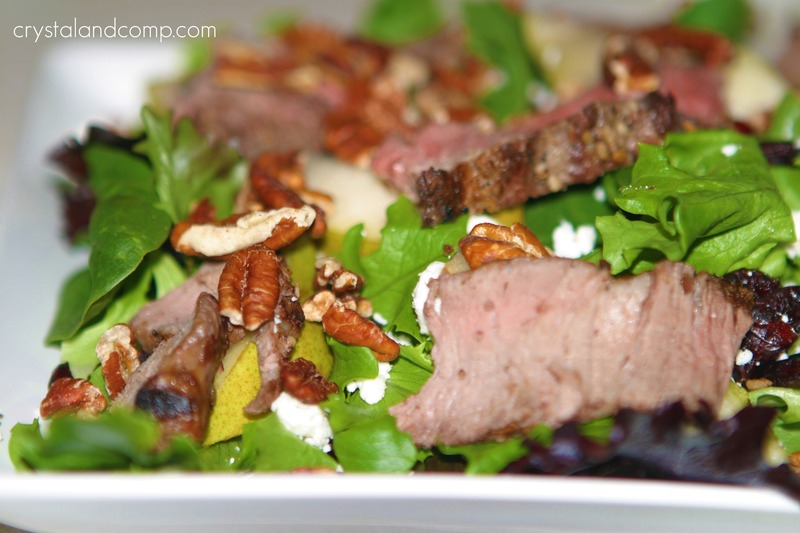 Steak on Salad is such an unlikely pair, but so delicious! First had it at a now defunct little restaurant. We don’t make it often enough! 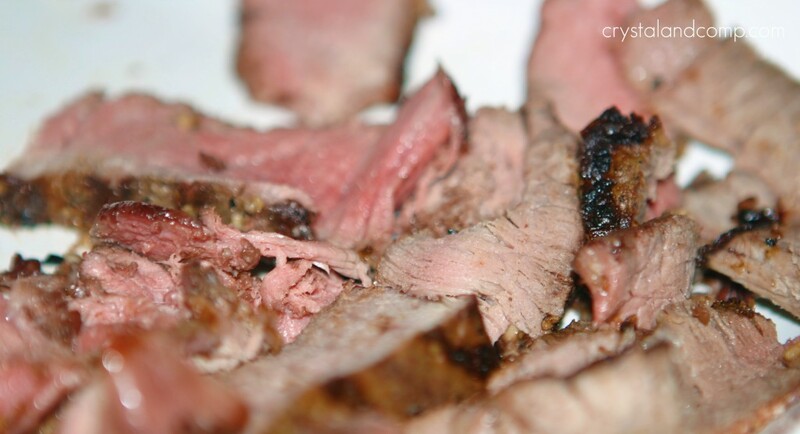 I am pinning this recipe – cattlemen know their beef! Sounds delicious but I wish they would provide nutritional information since I never get a “free” night! SimplyForties recently posted..Trendspotting in D.C. – Two Bags for Every Woman? Hi there. Thanks so much for taking the time to leave your thoughts. Here are the nutritional facts: Nutrition info per serving: 321 calories; 14 g fat (3 g saturated fat; 7 g monounsaturated fat); 67 mg cholesterol; 434 mg sodium; 21 g carbohydrate; 3.3 g fiber; 26 g protein; 7.6 mg niacin; 0.6 mg vitamin B6; 1.4 mcg vitamin B12; 2.4 mg iron; 30.0 mcg selenium; 5.1 mg zinc. 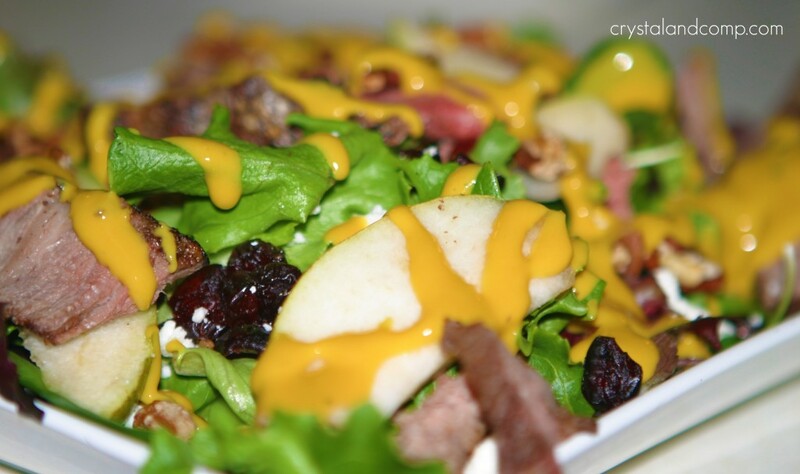 The Texas Beef Council has them listed at the end of the recipe (http://www.txbeef.org/recipe_book/salads/tenderloin_cranberry_and_pear_salad_with_honey_mustard_dressing). Glad to know that is something you’re interested in as this campaign is about healthy power food and meals the fuel your body. Let me know if you try the salad. It is amazing and filling! The garlic is genius, I should have tried it! Sounds yummy! I’m pinning it. Crystal, this salad has my name on it, I could eat a salad like this everyday! Hope you are having a great week end and thank you so much for sharing with Full Plate Thursday. Miz Helen- I too could eat a salad like this every day. It was so delish and the homemade dressing came together in a snap. This sounds fantastic! Love the fruit and meat combination. Great idea!